well, this was a first for me. i know many seasoned bloggers have been asked to review a product, but this is my first time. i asked questions like “how much will it cost” and “by when do you need it returned?” and “are there other fees?” to my delight, it cost us nothing and it is ours to keep. thank you, learning resources! 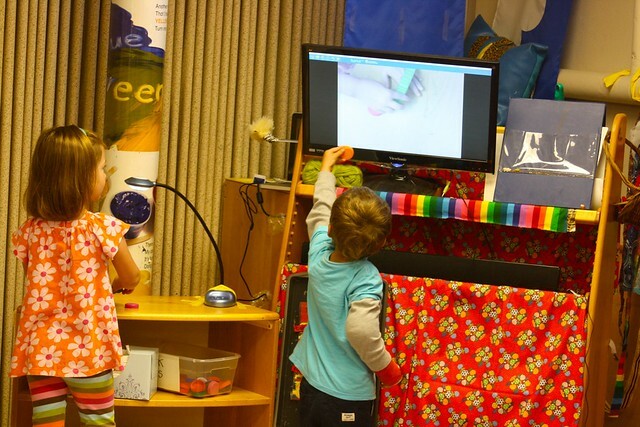 we received the luna interactive projection camera from learning resources to use and review. we already use my computer, an external speaker and an external monitor. i could quickly determine that this luna camera offers something different than my computer’s camera. before i started using it at preschool, i read about it online. another reviewer mentioned one problem is the camera being top heavy. 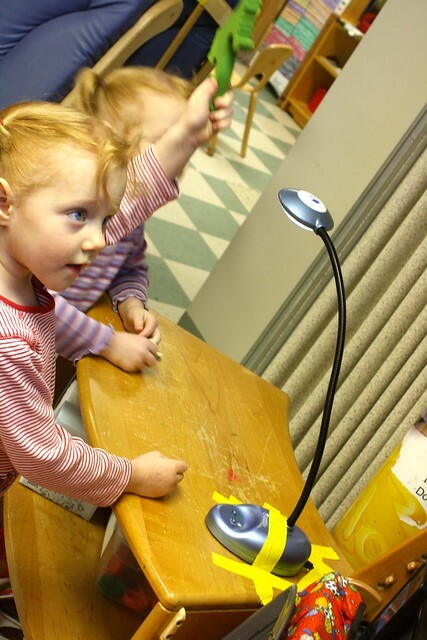 we experienced that too, and wanting the children to be able to move the camera, we took care of it with a bit of duct tape. things that are small look bigger on the screen. 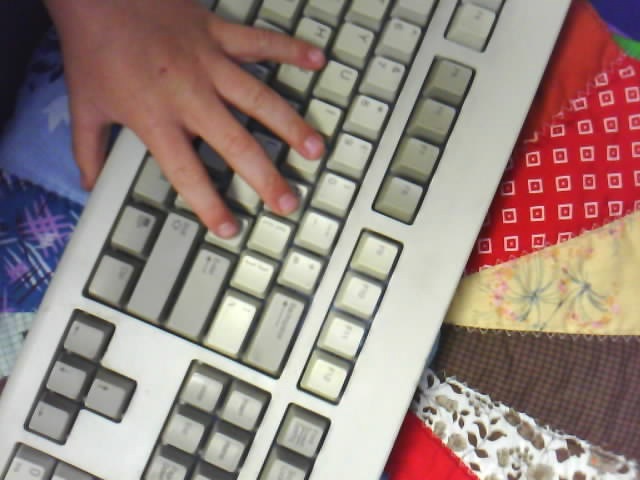 you are allowed to push the camera button anytime you want and the picture goes on ms. kristin’s computer. you can make scenes and then take a picture so you don’t forget them. you can push the light button to turn the light on and off. if you are gentle, you can move the camera. the camera is connected to something called a “neck” and that is funny. it doesn’t matter how many pictures you take. *true: the first day we had the luna camera, there were over 280 pictures taken…i found them all on my desktop! the teacher can draw a picture and everyone can see it better. it feels like a movie when you read the book under the camera. it is a real camera, so you have to be careful. if the lights are off in the room, everything goes in slow motion. *true: when our classroom lights are off, there isn’t enough light to see things move in “real time.” making sure the lights in the room are on takes care of it! you can make things go upside down and side ways. *true: there is an option to rotate the image on the screen. 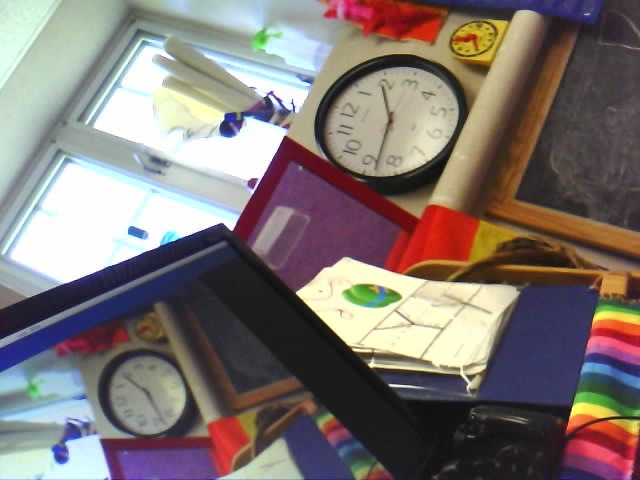 already, the luna camera has changed our group times. the variety and flexibility it provides has enhanced looking and listening times. a bigger monitor would make this product more beneficial because the image from the camera would be bigger (that has been added to my wish list!). it has also changed work time (this is what we call “free time” or “play time” or “center time”). i have it set up all day, every day as another option for children to explore with. and explore they do. 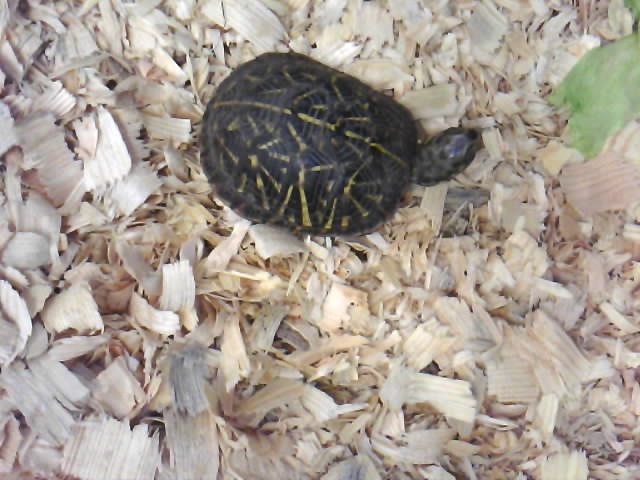 the following photos are taken by someone pressing the “camera” button. we are grateful for this product and highly recommend it. and thanks to learning resources, i have one to give away. leave a comment and one random winner will be chosen. go team! there is another product we’re reviewing soon, so stay tuned! Very cool! It would be well-loved in my preschool classroom! Thanks for the chance of winning! this is such a great tool for learning – i would love to win it! I really like the Luna Projection Camera, there are so many uses for it. And the idea of duck taping it is great. I hope I get it! Would love to add this to my classroom!! This looks like so much fun. I can imagine the possibilites are endless. Our students would LOVE this. Thanks. I can think of a million ways I would use this in my classroom. 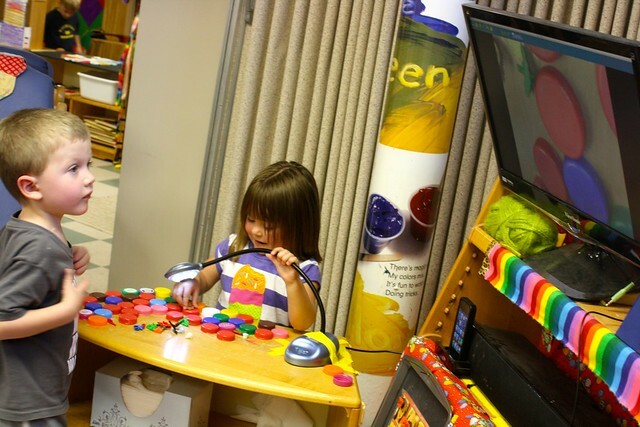 In the science center – with manipulative building – the writing center just to name a few. 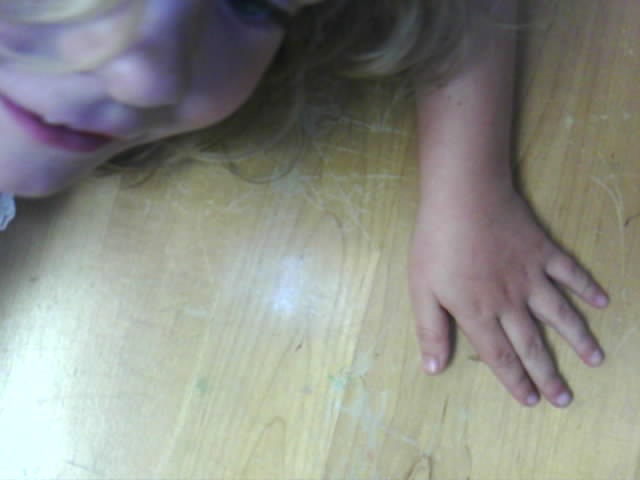 The children in my class already enjoy using the digital camera. This would be another way to document their work! I would love to have this camera for our new room at the Environmental Charter School called the Thinking Lab. 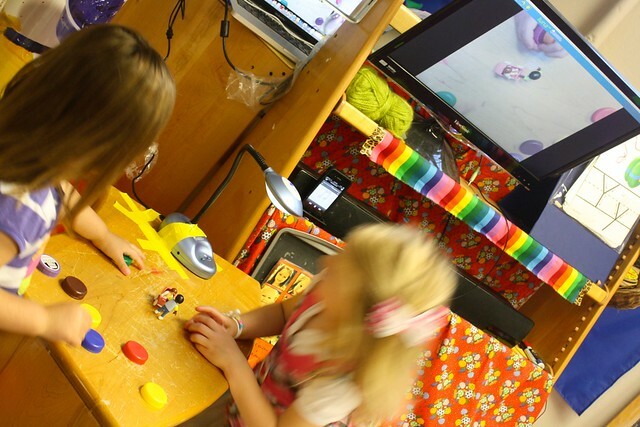 Students are exploring the intersection of art, technology, science, and design. What a perfect tool to capture these content areas! Oh WOW!!! This looks like so much fun to play with. I could find so many fun things to do with this camera, with my group of kids. this is so fun, i would love to donate this to my sons school, how cool is this, as he says fantastic! What a great product!! Fingers and Toes crossed your kiddos pick me!! 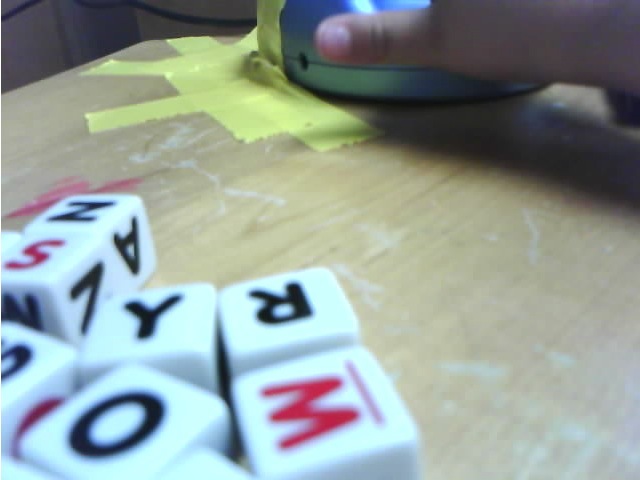 Love the activities and that the camera is “preschool” friendly. I think it is great that you got one to review! Oh my word…that looks so fun! This is amazing! …so many possibilities! Looks like the children had so much fun exploring! This looks so fun! My little Lion cubs love cameras of any kind. This looks like so much fun! 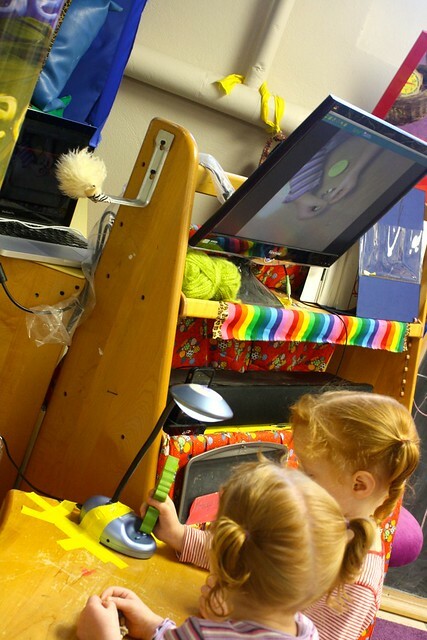 A great way to bring technology into the classroom without turning off brains. The kids would love it. 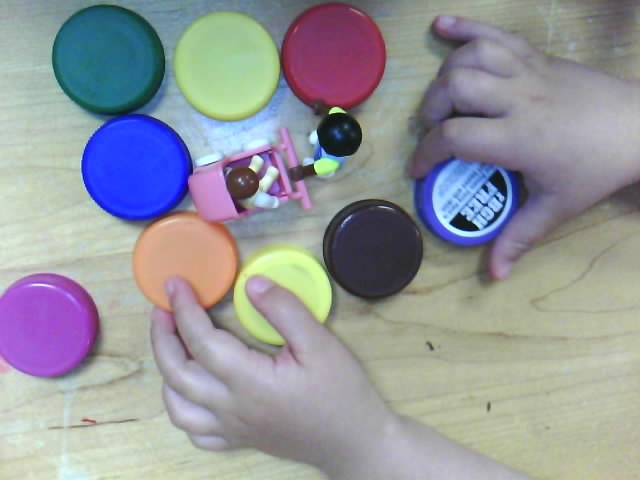 I use my camera frequently during the day in my preschool classroom, and the children often ask me to “take a picture” of their latest creation. This would allow them to do it themselves! Very cool! I would love to have one in the classroom! Woops! Sorry, didn’t realize the first one went through! “the camera is connected to something called a “neck” and that is funny.” Love it! neato! would love to win one! Luna lengthens listening and looking times? ….SIgn me up! Thanks for the constant inspiration! I love the kids comments! I can see how engaging this whole experience was for your kiddos. Fun! I love those photos. My favorites are the ones that includes faces! Wow, I’ve never seen anything like that. My preschool classes would love it. Thank you for the giveaway. This looks like it would be a great addition to my classroom. Thanks for the giveaway! Looks really interesting, I’m always interested in new ways to bring technology into the classroom. Awesome! 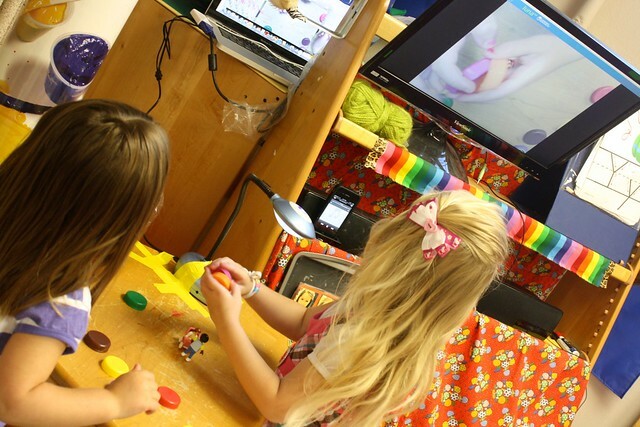 That looks like it would be fun & a great new tool for the classroom! That is so cool! And how fun to look at the photos the kids take. I can think of so many uses for this equipment!! I know the kids would live this and would be able to think of a ton of uses. This is great for our curious little minds of a little one! Pick us pick us! Would be a great way for my kids to communicate with their preschool cousin in Indiana – could do it through pictures and stories of our days. I love the idea of children being able to capture the little scenes they create – especially when they are in full exploration mode with critters, legos, blocks and rocks. I thought that was awesome when I helped out in the classroom last week. I would love to have one. We could use it for Parents As Teachers events. 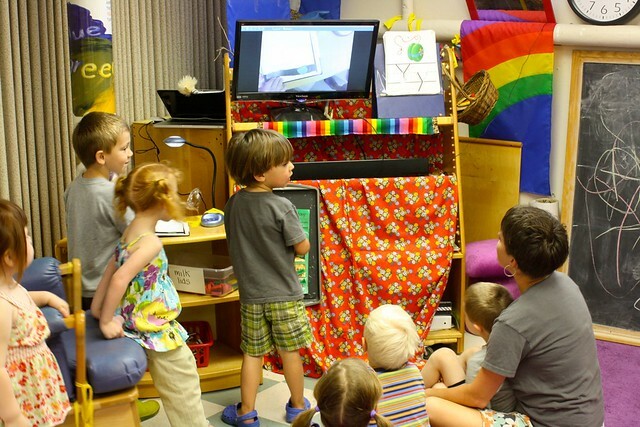 What an amazing piece of equipment – that would be wonderful to use in my Kindergarten class! We don’t have anything like this available to us so this would really give us the opportunity to enrich our program. I LOVE this and am instantly jealous for my son’s daycare to have one with which to play. I’ll definitely suggest this to my son’s caregiver as something for her wishlist. I would love to have this camera……..wouldn’t the kids (and me too) be excited to look at the tadpoles close up and then be able to take a photo and document the tadpoles’ development. Thanks for the chance! What a great product for the classroom! So happy to see the joy on your student’s faces! 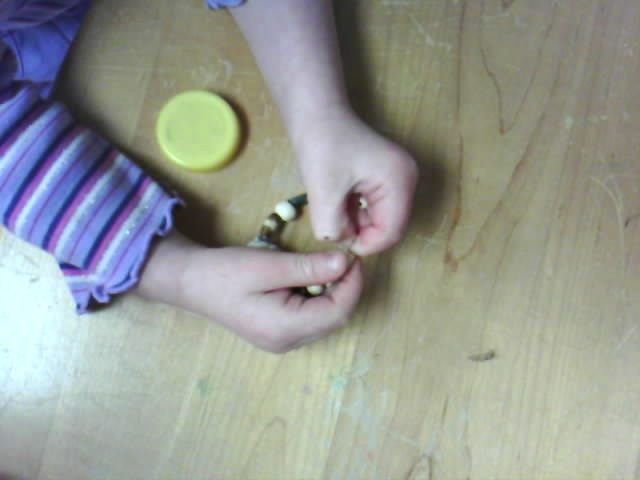 Great product and great idea to use it in a Pre-school setting! Ooooo pick me! Pick me! (please) :) it looks like something my little guys would love. They would take a zillion shots with it. This is so neat! Will it work to send an image to the television too? Thanks for the chance to win!